For autonomous ground vehicles (AGVs), one of the most important issues is path tracking. Conventionally, steering and velocity control are two typical aspects of the path tracking problem. Steering control is key because it is important to path tracking and related to vehicle lateral stability. Most existing algorithms have been developed based on a point-line vehicle-road model. They regard the vehicle as a rigid point, and employ a continuous curve or discrete points to describe the desired path. Compared with practical situations, this may cause collisions when tracking a more complex road ignoring the size and shape of AGVs. In addition, ignoring the width of the road may make AGVs deviate from the designated road region. However, according to the corresponding literature, there are few discussions of path tracking that consider the shape of the vehicle and width of the road. Based on this, considering the shape of vehicle and repeatedly testing the width of road are the challenges to solving the steering control problem. Additionally, an ideal algorithm should make control decisions repeatedly for AGVs according to the previewed traffic environment and road information. A new study proposes a novel regional path tracking issue in which the shape of vehicle is considered as a rectangle and considers the width of road. Then the road boundaries and actuator saturation are considered as constraints, and a model predictive control (MPC) method is introduced to solve the regional path tracking problem. Moreover, the experiments based on Hongqi AGV HQ430 are carried out to verify the effectiveness of the presented regional path tracking moving horizon method. Researchers Hongyan Guo, Feng Liu, Ru Yu, Zhenping Sun and Hong Chen, scholars at the State Key Laboratory of Automotive Simulation and Control in Jilin University, College of Communication Engineering, have written a study proposing the new algorithm. 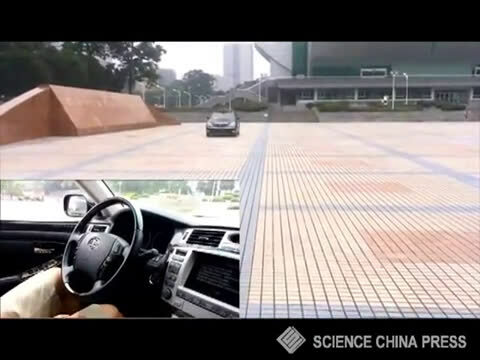 These five scholars reveal in the study, which was published in the SCIENCE CHINA Information Sciences, that the proposed model predictive control method could track a more complex road by tracking the desired lateral position of the road centerline of autonomous ground vehicles. The research was aimed at solving the shortcomings of the pure-pursuit tracking method, which may cause collisions when tracking a more complex road while ignoring the size and shape of fully automated vehicles. Moreover, it aims at solving failures due to neglecting of the width of the path when using the centerline to describe the desired path. In the study, the road boundaries and shape of the vehicle are both considered. In order to follow the centerline in the given feasible region, it needs to minimize the difference between the predicted output and the road centerline. In addition, considering the saturation of the mechanical system, the action of the steering wheel motor is limited. It also ensures that AGVs consume less energy. The road boundaries and saturation of the actuator are also described as constraints. The validation experiments were carried out on the Hongqi AGV HQ430. The AGV Hongqi vehicle HQ430 is composed of an environment perception system and a driving control system. The driving control system runs on a single-board computer responsible for decision-making, planning and control. The environment perception system includes two parts: lane marking detection and preceding vehicle recognition, which run on two different computers. The sensors used for perception are the right-and-left wheel odometer, braking pressure sensor and throttle valve position, a gyroscope and two cameras. Additionally, in order to obtain vehicle velocity and sideslip angle, the system uses an RT3002 developed by Oxford Technical Solutions. Moreover, in order to obtain vehicle position information, the system includes a GPS integrated navigation system. There are two additional computers used in the experiments, where the regional path moving horizon tracking controller runs in a Thinkpad T420, and another Thinkpad T420 is used to configure the RT3002. In the experiments, the front steering angle obtained from the proposed MPC method replaces the original front steering angle computed by the driving control system. The communication between the sensors, steering motor and driving control system is shown in Figure 5. The regional path moving horizon tracking controller needs to exchange information with other systems, and the user datagram protocol (UDP) is used to communicate with RT3002 and driving control system. In addition, the CAN bus is employed to exchange information from driving control system to steering motor, and vehicle system. The additional sensor equipped on the experiment vehicle communicates information with other systems employed by UDP.